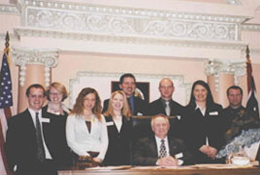 University of Wyoming students are eligible to participate in the State Legislative Internship Program. UW interns will be assigned to specific committees during the 40 day State Legislative session (during odd numbered years) in Cheyenne. Duties include assisting committee members with public hearings, conducting research on legislation and providing ad administrative support to committees. Being a legislative intern is an excellent way for students to gain knowledge and experience in the state legislative process and make important contacts for the future. Students may also be eligible for the 20 day Legislative Budget Session as well (during even numbered years). Students accepted as an intern can get up to 3 hours of Political Science credit during the spring semester of their internship (POLS 4550). 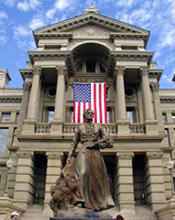 Students must complete and return (A&S 208) the Cheyenne Legislative Internship packet. Students may print and fill out the online forms or pick u p a packet in the main Political Science office, Arts and Sciences Building, 208. Students will be notified as soon as possible regarding their internship application after the deadline. Students from the University of Wyoming have an opportunity to serve as interns in the Wyoming State Legislature during its upcoming 2012 session. Three (3) hours of upper division credit in Political Science can be earned through successful participation in the program. UW interns will be assigned to specific committees of the state Legislature that have jurisdiction over a wide range of issues affecting the state. The committees that interns can be assigned to include, Judiciary; Appropriations; Revenues; Education; Agriculture; Public Lands and Water Resources; Travel, Recreation, Wildlife and Cultural Resources; Corporations, Elections and Political Subdivisions; Transportation and Highways; Minerals, Business and Economic Development; and Labor, Health and Social Services. Committee assignments will be made based on academic background and student availability. Internship duties will include assisting committee members with public hearings, conducting research on legislation and providing administrative support to the committee. Interns begin service in the Legislature at the beginning of February. Interns are expected to devote a minimum of 15 hours per week to legislative duties during the legislative session, including at least 10 hours per week at the Capitol in Cheyenne. Transportation is the responsibility of the interns although carpooling is possible. Minimum requirements for serving as a Legislative intern are junior standing, nine hours of course work in Political Science (or consent of Internship Coordinator) and at least a 3.00 grade point average at the time of the application. Students from all majors are eligible to participate. Students are required to complete an application packet available online or in the Arts and Science 136. The application packet should be completed and returned by TBA. All questions on the form must be answered to the best of your ability and are subject to verification. Applicants will be notified of their status as an intern as quickly as possible. Interns are expected to enroll in POLS 4550 Internship in Government (3 hours) for the Spring semester. In addition to their hours in Cheyenne, students are expected to complete specific academic work as well. Each student will be given Internship Guidelines that include book reviews and final reports and are expected to complete all requirements satisfactorily in order to receive credit for the course.